* Molded Base can be stretched up to 1/16"
* Stainless Steel Mesh Filter Media UPR just keeps bringing you the best and most innovative ideas. Here is the latest from the Top Secret Zone on UPR Products Trick new High-Flow Pro-M Big Mouth 304 Stainless Steel Mesh Filter. 100% Unique, the entire filtration element is made from a fine T-304 mesh (200 micron mesh). The superior design of a UPR filter will never be out performed by any other filter or ever wear out and become clogged and need replacing. 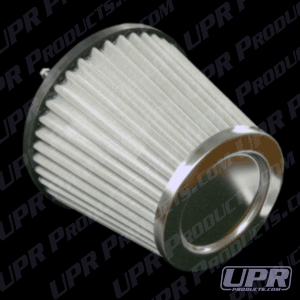 The UPR Big Mouth air filter was made with a super fine patterned mesh to straighten out airflow and substantially reduce restrictive turbulence that cotton filters fail to do. Quality Construction: Made with a ultra strong pliable rubber flange absorbs vibration and can be stretched up to 1/16" to fit in between sizes and a new type of high flow cotton element. No one else gives you the bold clean styling of our Aftermarket Dress Ups, Suspension and Performance Parts for your American Muscle Car like UPR Products! Installs in 10 minutes or less. Fits these Vehicles: 1979 1980 1981 1982 1983 1984 1985 1986 1987 1988 1989 1990 1991 1992 1993 1994 1995 GT V8 Mustang Roush & Saleen Vehicles.